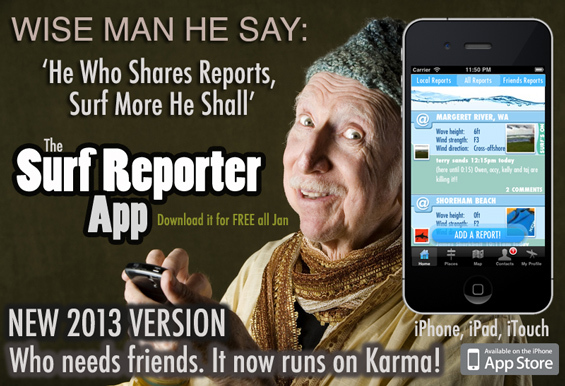 The new version of the Surf Reporter App is now available for FREE download this month only – and it runs on karma! The Sharkbait Surf App that is dedicated to real-time surf reporting is available FREE throughout January. No computer aided swell forecasting, no offshore buoy readings, it’s simple - just real surf checks from surfers on the beach! Recently updated for 2013 the app now allows everyone to share wave information (not just sharing reports between friends this time). Use the app to upload a report when you get to the beach and checkout reports from others. You then get to see what the waves are like from all other surfers adding reports throughout the day. Join the Surf Reporter App community, the more reports everyone uploads the better it gets, It runs on karma!! To promote the new version of the app it will be FREE to download all January so download it now and upload a report today! Sharkbait is also giving away a unique Surf Reporter t-shirt and sticker to the 3 people who upload the most reports in January!!! Feel the karma!